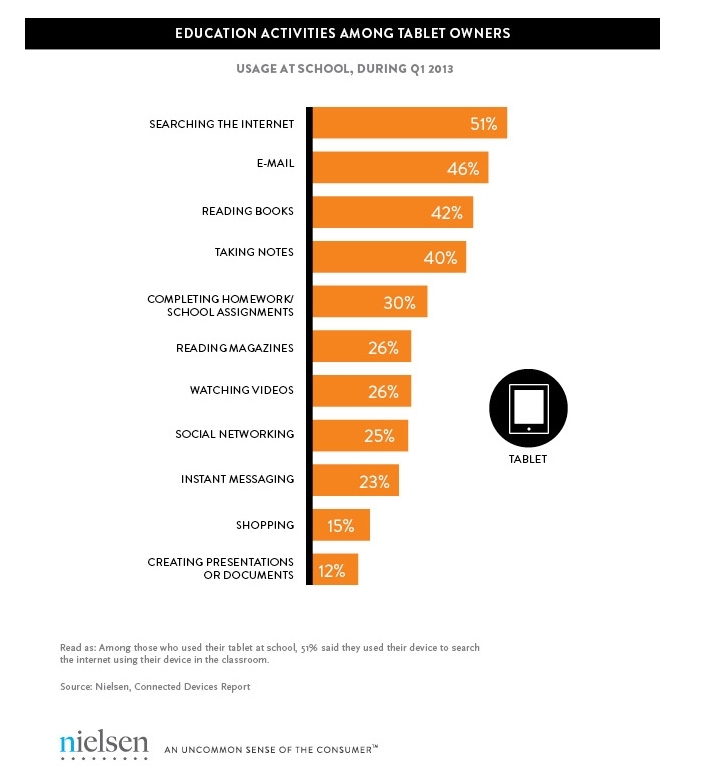 What really got my attention was the 40% who use tablets for note-taking. Sure, that’s a lot, but I expected more. In fact, let me go on the record that this number will increase substantially when students get used to having a tablet in their backpack. ‘Note taking’ is what I’d consider the proverbial ‘killer app’ when it comes to tablets and education (For those who don’t know, Merriam Webster defines ‘killer app’ as ‘a computer application of such great value or popularity that it assures the success of the technology with which it is associated; broadly : a feature or component that in itself makes something worth having or using’). What could be simpler than a student pulling out their tablet any time they need to take notes–with the keyboard or a voice recorder. They can even tape an entire class or lecture for review later. Students who couldn’t make class (sick, family emergencies, whatever else keeps kids out of school) can arrange with the teacher to tape it by activating both parties’ (free) Google Voice. A movie’s good too–a large file, but Google Drive (accessible from tablets) can handle it easily and then share it with whoever needs it. Other good note-taking apps include the built-in Notes (basic, but functional), Google Docs, Notability–I know there are more. The ability to take notes is not the problem. The issue is getting students used to that. Which maybe means getting teachers used to it. At some point, both parties will recognize the synergy and no one will use paper and pencil anymore. Another use that should be the killer app is digital textbooks. The late Steve Jobs, founder of Apple, believed textbooks to be an $8 billion market ripe for “digital destruction.” Publishers seem to agree. Every month sees more interactive, colorful, intuitive books popping up in classrooms around the world. All the major book resellers–Kindle, Barnes and Noble (what’s left of them), Amazon–are in this market, as well as dozens of other companies specifically focused on provisioning students (i.e., Chegg). Not only are digital textbooks easy to carry, cheaper, and more durable, they’re updatable, which allows schools to keep curriculum current. The reason this use languishes in the #3 spot is because so far, the product hasn’t lived up to its hype. Publishers say once they come up with features like note-sharing, digital annotation, instant quizzes, links to social networking, videos and the ability to add third-party content, the future will be unstoppable. And, if you have a tablet, you’ll use it to read digital texts. ‘Purpose-built Tablets’ are the type you see in medical environments where a doctor can access information and not be distracted by anything unrelated to the patient. You may have seen your plumber use these, too. He came to your house, swiped through his company prices and services to come up with exactly what you needed, and when he finished, took your payment and digital signature. Wow. They’re now coming to a school near you. Student-ready tablets suited exclusively for academic environments such as Educational Resources’ LearnPad come complete with standard school materials, specific internet access, apps integrated with the school curriculum. No distractions. No social media. No videos that weren’t cleared. No oops-your-child-saw-what? These tablets provide access only to the digital places students need to go–online sites, digital books, specially-picked videos–and flash isn’t a problem (flash is back). Students love them because they’re digital–which means they’re cool and cutting edge. Teachers love them because they focus on what needs to be studied. Yes, there are a whole lot of reasons students use tablets, but so far, none has taken off. One will, I assure you. What I don’t know is if it’ll be note-taking, digital textbooks, or purpose-built tablets that will turn tablets from the poster child for education reform to real change. What do you think?